We report a facile, high-resolution approach to quantitatively characterize hyaluronic acid (HA) and study its crosslinking reaction using electrospray-differential mobility analysis (ES-DMA). Mobility size distributions, number concentrations, molecular mass distributions, and polydispersity index of HAs were obtained successfully via a rapid analysis by ES-DMA (< 30 min). The limit of detection, the limit of quantification, and the precision of the mobility size measurement achieve 2.5 nm, 4.0 nm, and 0.3 nm, respectively. Size exclusion chromatography (SEC) was employed as an orthogonal approach, showing that the averaged molecular mass and polydispersity index of HA measured by ES-DMA were close to the results of SEC on a semi-quantitative basis. 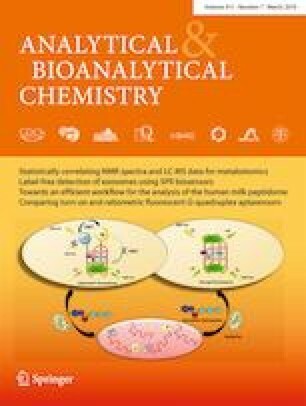 The 1,4-butanediol diglycidyl ether (BDDE)-induced crosslinking of HA was also able to be successfully characterized through a time-dependent study using ES-DMA, which has shown the promise of direct analysis of solution-based reactions. Both the extent and the rate of HA crosslinking (induced by BDDE) were proportional to reaction temperature and concentration ratio of HA to BDDE. The activation energy of the reaction-limited BDDE-induced crosslinking of HA was found to be ≈ 21 kJ/mol. The prototype study demonstrates ES-DMA as a new method for a rapid quantitative characterization of HA and its derivative product and providing a capability of real-time monitoring of the HA crosslinking during formulation process. The online version of this article ( https://doi.org/10.1007/s00216-019-01584-w) contains supplementary material, which is available to authorized users. This study received financial support from the Ministry of Science and Technology of the Republic of China (Taiwan) under contract MOST 105-2221-E-007-129-MY3 and MOST 106-3113-E-007-002.